The Etherea concept, shown at its Geneva show debut in 2011, previews Infiniti's new entry-level car. LONDON -- Infiniti believes its new entry-premium car will find a receptive market among young buyers in Europe, but industry watchers say the model faces a tough battle against established rivals such as the BMW 1 series and Audi A3. 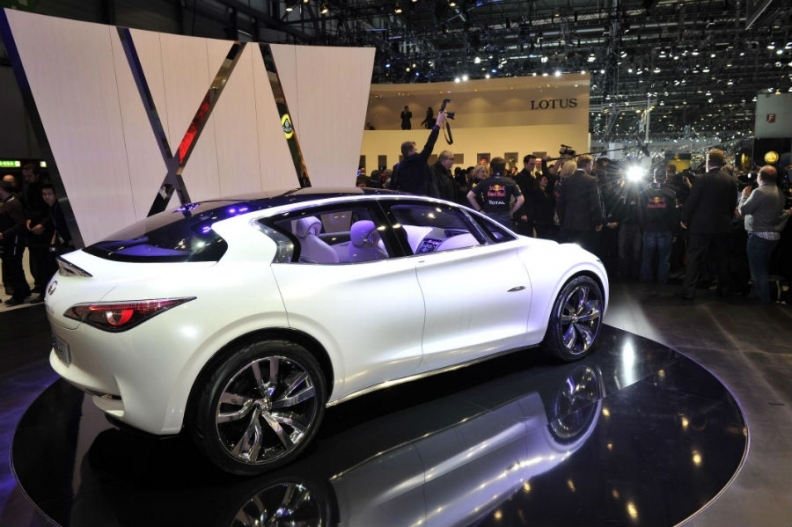 Infiniti plans to launch the model within four years to compete in Europe's growing market for small premium vehicles. Company executives say the car will be different from anything currently available in the premium compact class, not just a smaller version of a conservative luxury car. Jean-Pierre Diernaz, Infiniti Europe marketing director, believes the model will be successful because it will combine driving performance and an emphasis on style that German luxury brands do not offer. "The luxury market is dominated by a handful of German players in Europe, but the new generation of buyers is not necessarily interested in their daddy's brand," Diernaz told Automotive News Europe at a press event in London. "There is a need for more-modern luxury models." Infiniti's Etherea concept car, which was unveiled at the 2011 Geneva auto show, offered an early look at the design of the new model. Diernaz said the car will launch in Europe by 2016, but did not give a firm date. The car is expected to be built on Mercedes's MFA architecture, which underpins the second-generation A- and B-class model lines. Mercedes parent Daimler has a technology sharing partnership with Renault-Nissan. Carlos Da Silva, an IHS Automotive analyst, said Infiniti needs to do a lot of image building in Europe, where is debuted in 2008, and an entry-level model might help. "The car is a clever move as it is certainly one of the most promising segments in Europe," Da Silva said. "This is indeed the best way for Infiniti to gain a broader audience, one that can translate into significant volumes faster than with larger cars." Still, the competition will be fierce in a market sector that the Audi A3, BMW 1 series and Mercedes A class dominate. "This space is already crowded," Da Silva said. Nissan CEO Carlos Ghosn wants Infiniti to more than triple its global sales to 500,000 units by 2017, with Europe accounting for 100,000 units, up from a volume of 10,723 in Europe including Turkey and Russia. Originally conceived as a U.S.-only brand, Infiniti is a newcomer to Europe's tough premium market, having launched sales in western and central Europe just four years ago. The brand plans to increase its number of European dealerships to 200 by 2015 from about 50 now.